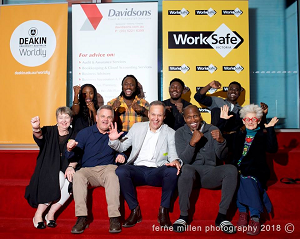 As show partners the Davidsons team along with guests attended the opening night at the Geelong Performing Arts Centre of Prize Fighter. And it did not disappoint! The audience was treated to an adrenaline-pumping, full-contact theatre performance. Our firm has had an extremely long and rewarding relationship with GPAC. We certainly treasure what we have and see the opportunity to sponsor a show as a great privilege. Both organisations (Davidsons and GPAC) have had long and influential existences within the Geelong and surrounding regions both from an Arts and Culture Community and with the Business Community. In many ways Art and Business are quite alike in the future focuses with Business needing to be more creative and innovative and Art continuing to look for ways to increase their sustainability. Similarly we are both working towards enriching the lives through our respective customer base.